This tool was a no brainer. Previously I had used the bog standard wire strippers that were about £5 from the usual motoring places. In my naivety I thought they would be good for the job. WRONG! I bit the bullet and was glad I did to invest in a proper set of single action automatic wire strippers. I have taken a comparison pic of the two tools so you can see what I mean later. The tool came with no box or no instructions. They just arrived well wrapped and ready to use. The steel tool’s metal handles are made into a slight contour via a heavy polypropylene grip and coated on the outside with a layer of rubber that is just enough to stop them slipping in your hands. The tool is designed to be automatic for any size of wire from the thinnest like telephone wire 0.13 up to 6mm, or if you are using American specs, that’s 10 – 24 gauge cables. (24 being the smallest). There is only one adjustment on the tool and that is the depth of wire to be stripped from the end. This is a real simple plastic side stop that you just push over. There is a small measurement on the opposite side to show how much you will remove. This seems to take a little guess-work out of the strip required, and if you have a few to do, they will all be identically stripped. To make the strip simply place the wire within the jaws up to the stop guide. When in place hold the wire still and then squeeze the handles together. I found that the process works best if this done fairly quickly. The reason it’s automatic is the quite clever mechanism, the jaws are on a cams and when you close the handle the jaws come down and first grab the wire on the left, then the right hand side has a slight blade that digs into the wire sleeve and then pulls the sleeve of the wire off as the handles are brought together. The action of stripping the wire is very positive feeling. Once you release the handles the they snap back together with a reassuring click via the robust spring above the centre pivot point of the handles. Job Done. Another good point to note on the tool are the wire cutters, these are located directly under the centre pivot point where the most pressure would be applied. I have cut plenty of wire in here and they have not shown signs of denting yet and make a nice clean-cut every time. Just below the wire cutters are various mouldings within the steel handles that will allow for the crimping of the Insulated Red, Yellow and Blue terminals that are most commonly used. And again below that, are the Non-Insulated crimpers. Although these seemed to work OK they didn’t do the job quite as well as my dedicated American Autowire Professional Crimpers. (They are another review). Fussy maybe? Perhaps! I did notice that on the larger wires the stripping motion could sometimes drag the sleeve off the wire and not remove it in a single one stop action. To get round this was real simple, turn the wire 90 deg and do it again. This time the strip was clean and worked fine. I only encountered this a couple of times on the upper most limits of the design. Other than that they performed every time as I would expect. A good little tool. The crimpers could be a little better on Non-Insulated terminals. 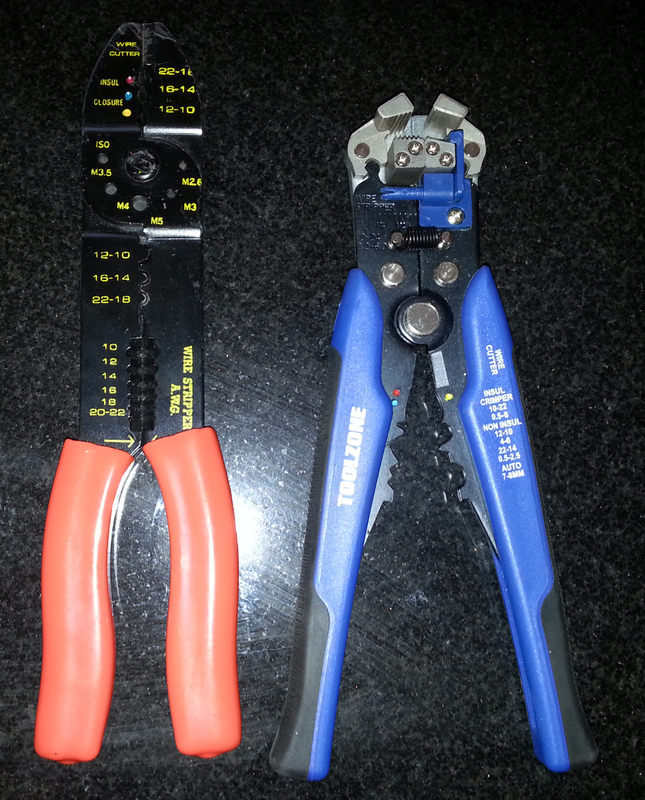 If you are working on any electrical system you have just got to have a set of automatic wire cutters. There are various types out there, gun style where the wire goes in the front, or this style being the most common ones used. Prices can vary quite a lot but shop around. I mentioned at the beginning I had a cheap pair of strippers, here they are next to the Toolzone pair. The orange handled type of wire stripping relies on the wire being placed between the two halves of the handle and clamped together to hold the wire and then pulled away. This style of srtippers do work, but pressure on the wire and the jaws themselves have in the past broken the wire and pulled a few strands out as well. To little pressure and the sleeve is not stripped off, it just stretches the sleeve and makes the re-strip a little more hazardous. You do have to make sure you get the right hole to get a correct strip. The Quality of these manual wire strippers various hugely. I had a previous set before these that I managed to bend the handles and the cutters at the tip dented after a cut with the first wire I put in them, they were so soft it was unbelievable. Having said that, a one of wire strip they should do the job if you’re not to fussy. But if you have plenty to do or have a few little projects on the go then automatic is the only way to go. Of course you could always do the other two options; strip the wire with your teeth, or use a safety knife to remove bits of skin while you are also removing the sleeve of the wire. Oh, quick bit of advice, if you are going to use your teeth make sure the dentist has a free appointment, just in case you chip that tooth or have a plaster ready!